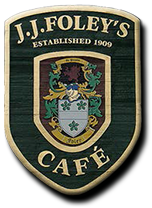 Welcome to J.J Foleys café, a public house located in Boston south end. Please see our menus below, if you have any special requirements and would like to sit down with us to build your own menu or have any dietary concerns please don’t hesitate to contact us to arrange a meeting. Our dining room is available for private events seven days a week and most nights, please call us to check availability. A minimum of $600 in food purchases is required when booking a private room, drinks or bar spend cannot be used toward this minimum. A gratuity of 20% and 7% food tax will be added to every bill. Parties who cancel before the 7 days your deposit can be used towards a future event. Party food is also to be decided and confirmed 7 days prior to the event as it takes longer prep time for large groups. A positive MA ID two forms of out of state ID are required for alcohol service we reserve the right to refuse service at this time. All person under the age of 21 MUST be off the premises by 9.30pm children must be supervised by adults at all times.